Thiensdorf (now known as Jezioro, Poland). Thiensdorf and Preußisch Rosengart is a former Mennonite congregation situated south of Elbing and east of Marienburg, West Prussia. Thiensdorf (now known as Jezioro; coordinates: 54.074167, 19.386111 [54° 4′ 27″ N, 19° 23′ 10″ E]; population in 1905, 174; in 1939, 174; in 2012, 160) lies approximately 3 kilometres (2 miles) north of Markusy (Markushof), 3 km (2 mi.) south-west of Elbląg (Elbing), and 80 km (50 mi) north-west of the regional capital Olsztyn (Allenstein). Preußisch Rosengart (also known as Rosengart, Rosengarten, Preußisch Rosengarth, and Preussisch Rosengart; now known as Rozgart; coordinates: 54.048611, 19.298333 [54° 2′ 55″ N, 19° 17′ 54″ E]; population in 1905, 359; in 1939, 368, and in 2012, 150) lies approximately 5 kilometres (3 miles) south of Gronowo Elbląskie (Grunau), 9 km (6 mi.) south-west of Elbląg (Elbing), and 85 km (53 mi.) west of the regional capital Olsztyn (Allenstein). The origin of the congregation, which was originally called the Kleinwerder congregation since it was not permitted to build a meetinghouse and could therefore not be named for a village, dates back to the Reformation. Dutch Mennonites are mentioned for the first time in Wengeln on the north shore of Lake Drausen (Drużno) in 1557. But they had no doubt been there for some time previously, at least since 1543, when the Anabaptists were expelled from the neighboring Prussian Oberland. The records show that by 1590 the west shore of Lake Drausen with the meadowlands of Kampenau, Markushof, Eschenhorst, and Rosengarth (about 150 hides) was in the hands of the Dutch settlers. (For the settlement of the Lake Drausen Lowlands, see West Prussia.) In 1586 Koen Hendrichs, Hans van Mechelen, Jacob Smet, and Long Dirk were representatives of the Kleinwerder congregation. The congregation seems to have received its stamp from Jan Gerrits van Emden, who came to West Prussia in 1607 because as a Waterlander he did not like the many schisms among the Mennonites in the Netherlands. He was chosen as elder in the Kleinwerder congregation. He was at the same time elder of the United Frisian, Waterlander, and High German congregation in Danzig. As late as 1786 Elder Gerhard Wiebe of Ellerwald called the Kleinwerder congregation "Waterlandish." Gerrits van Emden traveled to Moravia in 1610 and visited the five High German congregations there (see West Prussia). There had been contacts for some years between his congregation in the Kleinwerder and Moravia. In 1604 Josef Hauser, a Hutterite preacher in Moravia, with seven other Hutterites and their wives, came to Prussia. They took a lease for ten years on a farm in the Kleinwerder at Wengeln to establish a Bruderhof for seventy-three persons. Some West Prussian Mennonites were also admitted. But the relations were apparently not the best, for the Hutterite Chronicle records that when the Mennonite party was to come to communion Peter von Hasel (Hasselt?) and his wife refused to do so, and were banned for defaming the Bruderhof, accusing it of starving its people. Since competition with the Elbing craftsmen also created difficulties the Hutterites soon sold their Bruderhof. However, there were apparently some Hutterites in the Marienburg Lowlands in after times, perhaps even an independent congregation, for in 1700 Abraham Hartwich wrote in his description of the Werder, "A distinction is made in the Werder between the Manists of two branches, the 'Fine' or Flemish and the 'Coarse' or Frisians. . . . The latter condemn all other sects of the Anabaptists, including the Hutterites, but they gladly receive them when they have been expelled from other Mennonite groups. Therefore they are also called 'Garbage carts'" (Hartwich, 279). Apparently at the beginning of the Thirty Years' War, when the Hutterites were expelled from Bohemia, a considerable number of them came to West Prussia, especially to the Kleinwerder, and were absorbed by the Mennonites. Worship services were held in homes for a long time. In 1728 the congregation met at Markushof at the home of the elder Melchior Froese. In that year they received permission from the Bishop of Culm to build a meetinghouse. Hitherto a barn had served the purpose, into which benches were carried for the congregation. 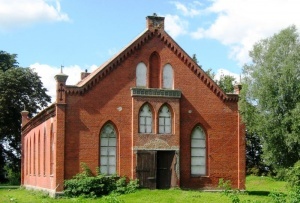 Thiensdorf Mennonite Church, Built in 1899 (Jezioro, Poland). The Kleinwerder Mennonites belonged to the Frisian wing. In 1772, when Polish Prussia was incorporated into Prussia, an attempt was made to unite the Flemish and Frisian congregations. The representatives of the Frisians, in order to make a concession to the Flemish, pledged themselves to prohibit mixed marriages with Catholics and Lutherans. On this point conflict arose within the Frisian congregations that in 1791 led to the schism of the minority of the Kleinwerder members under Elder Sperling, who favored the more liberal position. This group built a meetinghouse in Markushof and organized a congregation. The original congregation kept the meetinghouse in Thiensdorf. A healing of the schism occurred in 1888 when the dam broke at Jonasdorf and the Nogat River flooded the Kleinwerder. Together they built a new meetinghouse in 1890 at Preußisch Rosengart. This meetinghouse, contrary to Mennonite custom, had a tower. The revival movement of New Pietism affected some of the West Prussian Mennonites. Johann Quiring of Preußisch Rosengart, elder of the Thiensdorf congregation 1848-63, was deeply pietistic. His example was no doubt fruitful in his congregation. It was especially among the Kleinwerder Mennonites that a new impulse of deepening religious life occurred in the late 19th century, coming from the Gemeinschaftsbewegung. In their homes they held Bible study meetings and prayer meetings, as well as practicing the customary Mennonite neighborly love. Johann Wieler established several homes for orphans, which were under the management of the institution called Friedenshort. When the mass exodus of the Mennonites from West Prussia set in in 1945, Cornelius Dirksen remained in the community as the only West Prussian elder, under extreme difficulties serving his people in spite of his own physical weakness. Among the many who died of privation he also buried his wife, who died in 1947. In October 1947 he was expelled from West Prussia. According to a number of letters written to the Amsterdam Committee for Foreign Needs (19 May 1767, and 2 August 1767) the Thiensdorf congregation in 1767 then numbered 2,000 souls; the Lord's Supper was attended by 1,200 members. In 1852 the congregation had 808 baptized members, in 1887, 766 baptized members and 349 children, in 1939 1,124 members. The elders of the last 200 years were Melchior Froese 1728, Johann Peters of Markushof ca. 1730, Heinrich Peters of Markushof ca. 1730 (lived and died in the church building), Jacob Siebert of Nogathau ca. 1758-1784, his son Johann Siebert, preacher 1770, elder 1785-1798, Wilhelm Martens of Thiergarth 1798-1833, Franz Cornelson of Thörichthof, preacher 1808, elder 1834-1848, Johann Quiring of Preußisch Rosengart, preacher 1823, elder 1848-1863, Johann Penner of Thiensdorf 1864-1889, Johann Kädtler of Alt-Rosengarth 1889-1912, Johann Cornelson of Thiensdorf 1912-1922, Cornelius Dirksen of Markushof 1922-1947. Alenson, Hans. "Tegen-Bericht op de voor-Reden vant groote Martelaar Boek 1630 in Samuel Cramer and Fredrik Pijper." Bibliotheca Reformatoria Neerlandica, 10 vols. The Hague: M. Nijhoff, 1903-1914: v. VII. Crous, Ernst. "Vom Pietismus bei den altpreussischen Mennoniten im Rahmen ihrer Gesamtgeschichte 1772-1945." Mennonitische Geschichtsblätter (1954): 7-29. Händiges, Emil. "Zum 200-Jahrfeier des Baus der ersten Mennonitenkirche in Thiensdorf." Hartwich, Abraham. Geogr.-histor. Landesbeschreibung der drei im poln. Preussen liegenden Werder. Königsberg, 1722. Hege, Christian and Christian Neff. Mennonitisches Lexikon, 4 vols. Frankfurt & Weierhof: Hege; Karlsruhe: Schneider, 1913-1967: v. IV, 313-314. Hoop Scheffer, Jacob Gijsbert de. Inventaris der Archiefstukken berustende bij de Vereenigde Doopsgezinde Gemeente to Amsterdam, 2 vols. 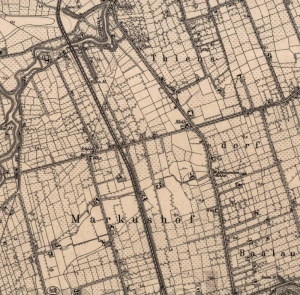 Amsterdam: Uitgegeven en ten geschenke aangeboden door den Kerkeraad dier Gemeente, 1883-1884: v. I, Nos. 1571-78, 1703-12; idem II, 2, Nos. 735 ff., 857. Naamlijst der tegenwoordig in dienst zijnde predikanten der Mennoniten in de vereenigde Nederlanden. Amsterdam 1793: 58 ff. Stowarzyszenie Konserwatorów Zabytków. 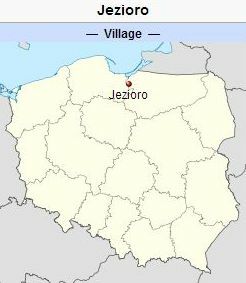 "Jezioro." Catalogue of Monuments of Dutch Colonization in Poland. 2005. Web. 6 October 2012. http://holland.org.pl/art.php?kat=obiekt&id=339&lang=en. Wiehler, Heinrich. "Aus der Geschichte der Vereinigten Mennonitengemeinde Thiensdorf-Markushof." Mennonitische Blätter (1928): 92-94, 99 ff., 108 ff. Wolf, Hans-Jürgen. "Familienforschung in Westpreußen." Web. 6 October 2012. http://www.westpreussen.de. Wolkan, Rudolf. Geschicht-Buch der Hutterischen Brüder. Macleod, AB, and Vienna, 1923: 470 ff. "Zwei verdiente Aelteste aus der ehemaligen Gemeinde Thiensdorf-Preussisch Rosengarth, Westpreussen." Mennonitischer Gemeinde-Kalender (1953): 23-26. Penner, Horst and Richard D. Thiessen. "Thiensdorf and Preußisch Rosengart Mennonite Church (Warmian-Masurian Voivodeship, Poland)." Global Anabaptist Mennonite Encyclopedia Online. October 2012. Web. 18 Apr 2019. http://gameo.org/index.php?title=Thiensdorf_and_Preu%C3%9Fisch_Rosengart_Mennonite_Church_(Warmian-Masurian_Voivodeship,_Poland)&oldid=144630. Penner, Horst and Richard D. Thiessen. (October 2012). Thiensdorf and Preußisch Rosengart Mennonite Church (Warmian-Masurian Voivodeship, Poland). Global Anabaptist Mennonite Encyclopedia Online. Retrieved 18 April 2019, from http://gameo.org/index.php?title=Thiensdorf_and_Preu%C3%9Fisch_Rosengart_Mennonite_Church_(Warmian-Masurian_Voivodeship,_Poland)&oldid=144630. Adapted by permission of Herald Press, Harrisonburg, Virginia, from Mennonite Encyclopedia, Vol. 4, pp. 710-711. All rights reserved.